For the past few months I have been passing by Partea on Blanshard street right in the heart of downtown Victoria. I’m just not sure about the latest food trend, cheese tea. It has been widely popular in China, Malaysia and Singapore. 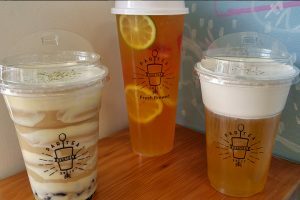 Cheese tea starts with green or black tea and is topped with a creamy cheese foam made from whipping cream, milk and at Partea: local organic cheese. They top it all off with a pinch of rock salt. You are supposed to drink it right from the cup so that you get both layers of taste, the tea and the cheese. This way you are pairing the cheese and the bitterness of the wine. Partea also makes a fruit tea that combines green tea with an assortment of fresh fruit including watermelon, strawberries, orange, passion fruit and lime which floats in the tea.